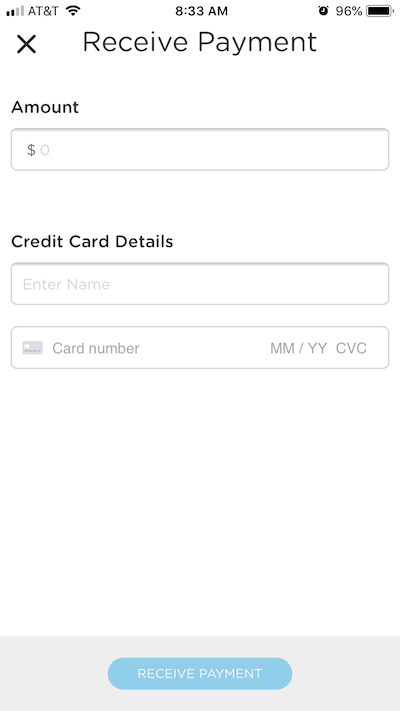 You can receive payments in app when parents pay via cash, check, credit card, or other. 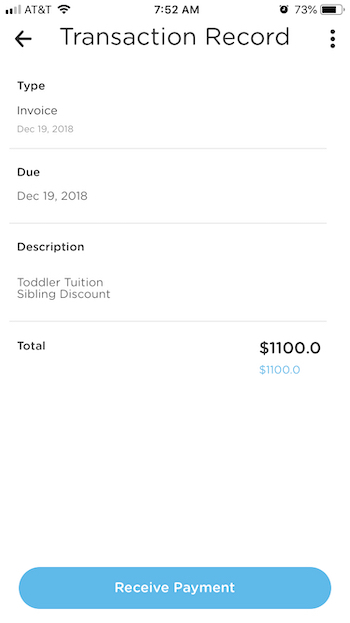 Note: In order to accept credit card or bank account payments, parents will need to set up their preferred payment method by logging into the Kinderlime website. 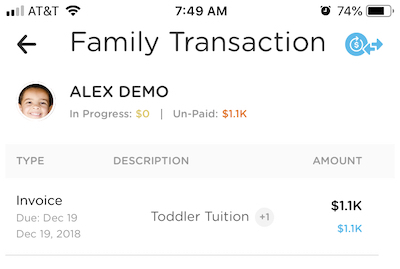 Click on the Billing icon from the app home screen, then click on the family account you want to receive a payment for. 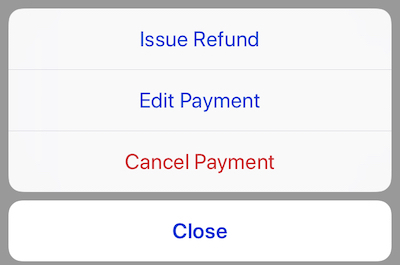 1) You can click on the blue icon in the upper right and select the "Receive Payment" option. 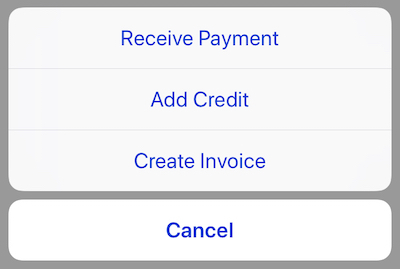 2) Click on the invoice you want to receive payment for, then click on the Receive Payment button at the bottom of the screen. 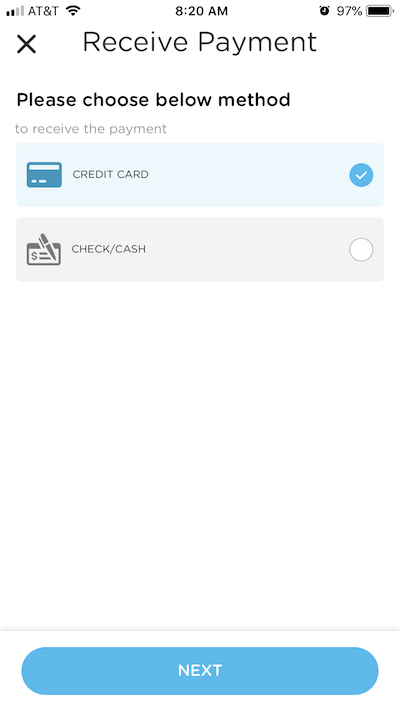 For credit card payments, you can manually enter the amount and card information. Note: The card will NOT be stored in our system or connected to the parent account. The parent would need to log into their own Kinderlime account in order to save a payment method or set up auto-pay. When receiving a cash/check payment, you'll need to fill out the amount being paid, the mode of payment (cash, check, or other), and include a description. Successful payments will appear with a green check mark next to them. To make changes to a payment, go to the family account page and click on the payment. Then select the vertical ellipsis (...) in the upper right and choose which option you would like to complete. 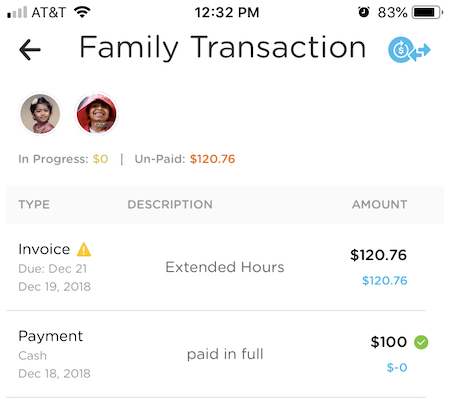 Once you have cancelled a payment, you'll see it in the family account page with a red X next to it. To remove it altogether, click on it again, then click on the vertical ellipsis and select "Delete."